This pack contains specific eulogies and verses for a natural death, after a sudden/unexpected death and after a long illness. They express your sorrow at the loss of a dearly loved wife and companion.The short verses add an unusual and poignant ending to the eulogies. 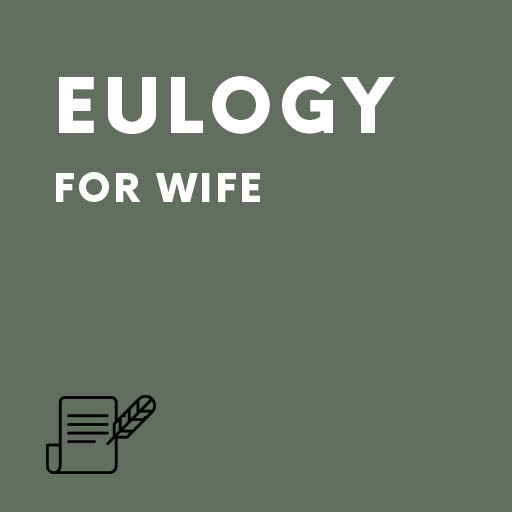 Simply say at the end of the eulogy that you feel your wife should be remembered in verse and then say the verse quietly and sincerely. The sympathy acknowledgement verses give a choice of appropriate “Thank you’s” to those who have supported you and shared your grief. The In Memoriam verses provide you with a choice of verses for the cards that are a lifelong reminder of someone who was special in your life. The short verses are ideal if you want to end your eulogy for wife on a meaningful and memorable note. If you wish to thank people for their support during her illness and death why not send one of our acknowledgement verses? Our verses for an “In Memoriam” card will give you a choice of ways to say “Gone but never forgotten”.